This is a thinner version of Frosty Rays. It works better when you are doing a tent stitch on 18 count. It will also work fine for longer stitches on 18 count so you do not need to switch between the two types while stitching. Petite Frosty Rays is made from Flair and has Petite Treasure Braid Petite inside of it. This adds a nice sparkle to your piece and is a great touch. 6 yds. each card. 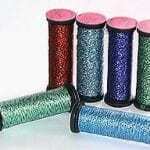 If you find that it frays or unravels while stitching, try using Thread Zap on it which burns the end. 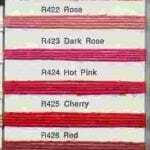 We carry many colors of Petite Frosty Rays and can order them for you also. Please understand we may need you to order at least 3 of the color desired as they come in packs of 6. 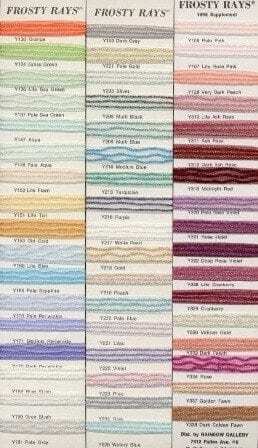 There are 206 colors altogether.